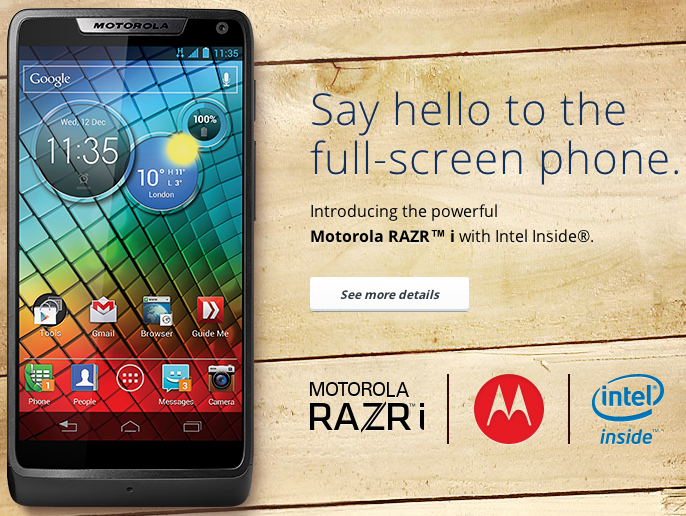 Motorola has just revealed its first smartphone powered by an Intel mobile processor, the RAZR i, at an event in London this morning. Although the exterior of the new device shares a lot of similarities with the previously released RAZR M, such as a 4.3-inch display and Kevlar coating on the back, it couldn't be more different inside, packing an Intel CPU clocked at 2GHz. Motorola claims that the processor is "40% more efficient" than the competition, comparing the RAZR i to the iPhone 4S, so it will be interesting to see how much usage can be squeezed out of the phone's 2,000mAh battery. Like the RAZR M, you'll find an 8MP camera on the RAZR i, and thanks to the 2GHz Intel CPU and a dedicated camera button on the side of the phone, you will be able to launch the camera in less than a second. In that time, you will also be able to capture 10 images in 'multi-shot' mode. The phone will launch next month with Ice Cream Sandwich (Android 4.0), but Motorola says that it's "upgradeable to Jelly Bean." As this phone will be one of Motorola's flagship devices in Europe, I'm sure we'll see software updates sooner rather than later. It's been a while since Motorola made a big splash in Europe, with the Milestone (the company's re-branded and underpowered Droid) failing to gain any traction in EU markets. One phone that was very successful however, especially in the UK, was the original RAZR, so Motorola is sure to have high hopes for the RAZR i when it launches next month. It will be available in the UK, France, Germany, Argentina, Brazil, and Mexico initially, with more countries to be announced.